These are generic instructions. Product specifics override these instructions. For example for epoxy products we generally suggest grinding, BUT, for All Weather Floors Polyurea an acid etch may be more appropriate. For Rust Bullet often a light sanding is a good idea if prep is required. Always follow product specific suggestions, datasheets and information on cans. Full broadcast system consists of a liquid base coat followed by a complete broadcast to rejection with flakes and a clear topcoat. Random Flake system consists of a liquid base coat followed by a random broadcast of flakes. Clear coat is optional, but recommended. Solid Color system consists of a liquid base coat with texture granules broadcast in liquid and back rolled into the coating. Second coat is optional, but recommended. Prior to the installation of any garage floscor coating system, necessary steps should be taken to make sure a moisture problem is not present. Step 1. Prep- The surface should be prepared by, acid wash, grinding, shot blasting, scarifying or similar. The objective is to create a smooth surface with open pours in the concrete. Always remove dust and any foreign debris prior to coating. Use acid wash or degreaser for oil and grease spots. Thoroughly neutralize area if acid wash was used. Surface should be completely dry before coating. Surface must be free of oil or oil residue for proper adhesion. Step 3. Application- Start by applying your primer material. Follow the same instructions as the base coat, but obviously you will not be adding flake or antiskid. After mixing your basecoat material pour the material in a line at the inner most wall of the area to be coated so you can work your way out. Empty entire contents onto the floor. Your squeegee is your spreader on 100% solids systems. Rollers work on high solids and urethane.. A handle is not included with roller frames or squeegees. A broom stick handle often works well. Use your brush to apply material into hard to reach areas where you cannot get with the squeegee or roller. Using your squeegee or roller , spread the puddle of material from side to side across the garage being sure to put even stiff pressure on the handle. Holding the squeegee at a 30 degree angle works like a plow pulling the material back as you walk from one side of the floor to the other. Continue until you squeegee the entire batch. Continue this process until you complete the floor. (If you have a partner to help, they can mix coating and or back roll the floor and throw out broadcast) There are two good ways to apply coating with a broadcast. The first is to squeegee or roll out all material. If you are using a squeegee go back on spike shoes and back roll the entire floor, then broadcast flakes. For random broadcast just pinch a few flakes in your finger tips and randomly broadcast into the air. Throw the flake upwards, not down. For a full broadcast you will fill a bucket and carry out on the floor with spikes and broadcast handfuls of flakes into the air to completely cover the surface ( broadcast to rejection). As an alternative you can squeegee or roll out each batch and back roll and apply broadcast as you go. This is necessary if you do not have spike shoes or if you are covering a very large area and cannot complete the whole floor quick enough. The result should be the same if you are careful and follow the directions closely. Once you have finished with the first base coat and flake broadcast if applicable, wait the time period specified in the spec sheet before applying the top coat if included in the system you purchased. 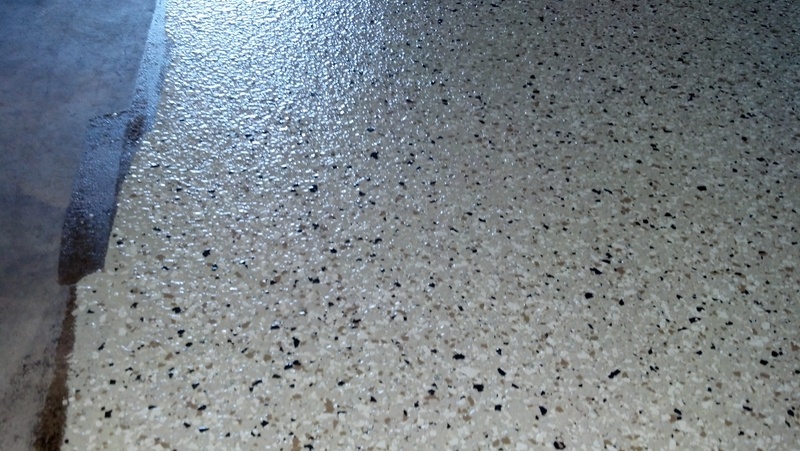 Some epoxy systems may have a solid color or no top coat depending on the system you chose. If a random broadcast system is being installed you simply need to blow off any loose flakes if any and continue to top coat. If full broadcast system is being installed you will need to scrape the floor with a floor scraper or wide stiff putty knife. Be sure to scrape (profile) the floor well. You want to create as smooth of a surface as possible. You should be able to run your hand across the floor without feeling flakes sticking up. If you don’t scrape the floor well you will have a rough coarse surface once you apply the top coat. Be sure to remove all excess or loose flakes with blower or vacuum before applying top coat. The application of a top coat is similar to that of the base coat. Our urethane is typically applied with a roller. Mix up a batch of top coat and sprad over the entire surface -typically working side to side. Be sure to use a chip brush to get any areas you cannot with the squeegee or roller. If you are using anti-skid that we provide we suggest mixing into the top coat before applying. 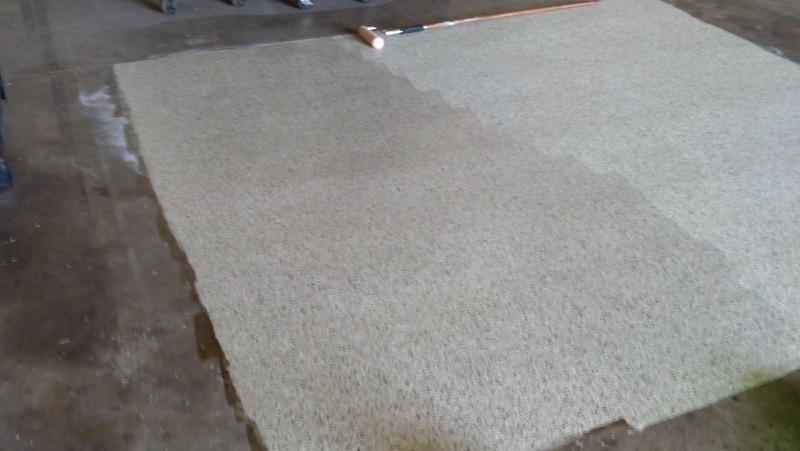 Continue this process until you complete the floor. (URETHANE TIP) POUR OUT A SMALL AMOUNT OF MATERIAL AND SATURATE THE ROLLER COMPLETELY BEFORE BACK ROLLING. THIS WILL ENSURE YOU DON’T SOAK UP THE MATERIAL FROM THE FLOOR AS YOU BEGIN ROLLING. DRY TIME:- You should always let your floor system completely cure(Dry) before using. 24-48 hours for walking on and 72 for driving on. Step 4. Clean up- If you have material left over in the bucket after completing the floor simply let it harden in the bucket. The left over material will come out once it’s hardened or it can be disposed of in trash. Unmixed material should be mixed together and let harden before disposal. Lacquer thinner or acetone clean uncured epoxy well. PLEASE NOTE: The installation of the system, proper preparation of the substrate and closely following all steps is your responsibility. While we are happy to help you with installation issues the installer assumes all risk and liability for improper installation. The instructions below this line are from prior systems but the requirements for moisture testing and additional information remains relevant to this system so please review. Please note: We now have an approved acid etch product that you can order instead of grinding. 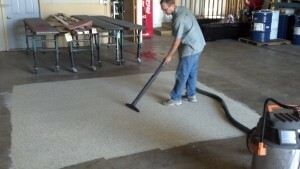 To insure the success of your floor system, proper substrate preparation is key! (Concrete Prep). The best method of surface preparation is grinding. We recommend using a hand held diamond grinder or walk behind single head diamond grinder for larger projects (250sqft) or more. Grinding the surface exposes the pores of the concrete which allows the coating to penetrate for a monolithic bond. 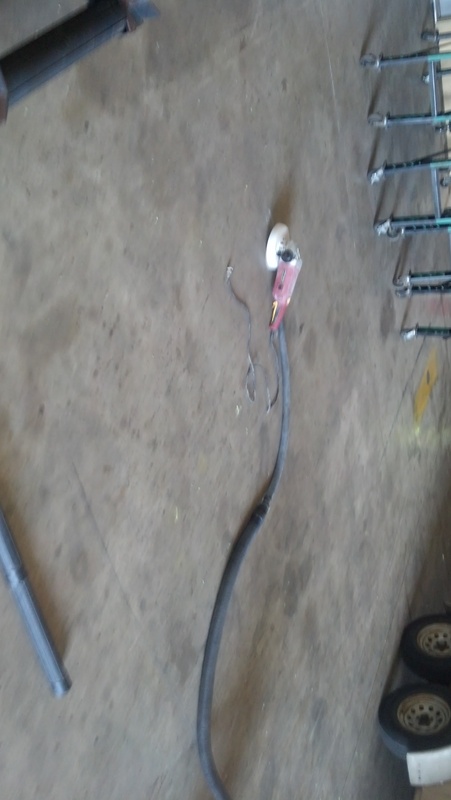 A vacuum should be attached to the grinder to remove the dust and debris while grinding. discolorations from oil and other contaminants. Using a degreaser clean the contaminated areas and let dry. After the floor has dried, start by snapping a chalk line at the middle of the garage door track from one side to the other. Next grind along the chalk line being sure not to go over the line. 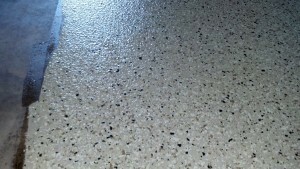 Continue grinding the remainder of the floor until uniform in appearance and porosity. Take a little cup of water and using your hand dip a few ounces of water onto the surface. If the water soaks into the concrete quickly the surface has been properly prepared. If the water sits on the surface and does not want to be absorbed by the concrete, more of the surface needs to be ground to expose open pores. It is fairly common to have hydrostatic vapor transmission. This means moisture or vapor travels through the pores of the concrete and comes to the surface with some degree of pressure. Some degree of moisture at the surface is acceptable when applying liquids to concrete, but too much can and will lead to adhesion problems. Please do not skip the moisture tests! IMPORTANT! 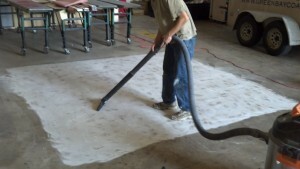 Place several 24″ by 24″ plastic sheets randomly throughout the area to be coated after completing surface preparation. The test patches should be applied to the surface for a minimum of 24 hours to get the most accurate results of the test. To determine if moisture is present inspect the test areas after 24 hours of adhesion to the substrate. Look at the plastic and if moisture is present on the underside of the test plastic then you should apply a liquid vapor barrier prior to installing the floor coating system. If it is determined by the moisture test patches that there is vapor transmission present in your concrete substrate, you will need to apply one coat of liquid vapor barrier prior to installing your floor system. First make sure the floor is clean, dry and free of debris. Mix and apply the liquid vapor barrier in accordance with the instructions provided. Most garage floors and concrete surfaces have what is called a control joint. This is a purposefully placed saw cut that is designed to control where the concrete will eventually crack. YES, we said eventually crack! It is an almost certainty that concrete will crack. So the installers of the concrete place saw cuts so the concrete cracks in the joints of the cuts instead of a spider web of cracks throughout your floor! For a seamless look to your floor system you can use a Flex joint filler. Flex joint filler requires careful installation! See Instructions on packaging for use! Using a small putty knife or drywall taping knife fill the control joint and scrape the surface smooth to remove all excess Flex joint filler. The surface of the Flex joint filler should be flush with the concrete after filling the joints. If the control joints are not completely flush after your first application of Flex joint filler, wait 2-3 hours or until dry to the touch and apply another coat of Flex joint filler to make the joints flush with the surface. We have several joint fillers available so thise instructions will vary. Please consult the can label. Some garage floors and concrete surfaces will have some stress cracks. This is common and easy to fix using the Crack repair. The Crack repair material comes in a small kit and is applied with a small putty knife or drywall taping knife. Look over the floor and note all the cracks before beginning the repair. Mix up the Crack repair material per instructions on the label and fill in all the cracks. (Tip) apply the Crack repair material much like drywall mud. Apply in one direction and scrape off the surface in the opposite direction along the crack. Be sure to scrape all excess material from the surface so there are no globs or excess material. Allow Crack repair dry per the instructions included. Then proceed step 1 of the installation instructions. Start with opening the container of the Base coat color liquid and giving it a good stir until uniform in color. (Mix all Base coat color containers) Next open your box of decorative broadcast media and place directly outside the garage door so it’s readily available for use! (Tip) an empty ice cream pail can be used to transport the broadcast media to the garage floor when broadcasting. Next get your included floor spikes adjusted so they fit snugly over your shoes (Helper job). Install one of the supplied roller covers to the roller frame and attach the frame to a broom handle or extension pole (not supplied). Place a liner in the paint tray and have all your materials and installation tools prepared. Mask off any areas where you could accidentally contact with a wet roller. Walls, doors, trim etc. Along the chalk line you made earlier at the edge of the garage door opening, run a strip of duct tape to the outside edge of the line. This will be the end point of the floor system. Once completely coated you will pull the tape off to reveal a nice straight edge. FULL BROADCAST FLAKE FLOOR- A full broadcast flake system which you will be installing refers to the process of fully covering the base coat liquid with decorative media. It works by first applying a solid base coat liquid and immediately broadcasting the floor with decorative media. The final step will be applying a clear protectant top coating to seal in the chips and provide a wear surface. Read all the instructions before starting step one! For the best results and ease of installation we recommend 2 people install the system. To prepare the surface for the final coating the surface needs to be profiled. There is an excess of chips or decorative media that need to be removed from the surface before applying the finish coating. 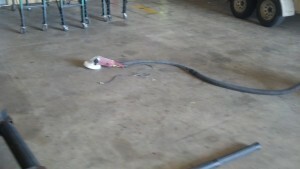 To remove the excess media we recommend using an industrial vacuum (Shop Vac) with a wide floor head attachment. The best method is to use the head of the vacuum to scrape the floor (profile) as you are vacuuming the excess chips. This is the quickest and best method of removing the chips. The surface of the chips need to be scraped down to remove and chips that are not bonded or lying flat on the surface. This is called Profiling. You can also broom the excess chips to the wall and use a wide blade floor scraper to profile the chips, but either way you want to knock down any chips sticking up thoroughly remove any chips not sticking to the floor. You are trying to achieve a smooth feel to the floor surface and the media lays on top of each other so be sure to profile the floor well. Once you are satisfied the floor feels pretty smooth and you have removed all loose chips, proceed to step 3. 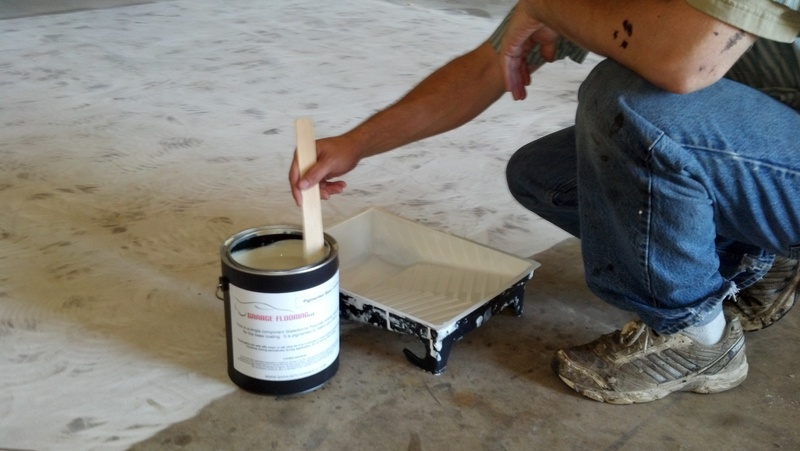 The Top coating is the key to a durable floor system. Multiple coatings can be applied for added durability and strength or if you are unhappy with the results of your first application — It has been our experience that one coat is sufficient for most residential applications. The UV Top Coat is a two component material. Mix like the base coat. It will appear slightly milky white in color but will dry with a clear glass like finish. Prepare your roller, frame,and tray, and pour some UV Top Coat into the tray. This coating has an limited pot life, meaning you only want to mix a gallon at a time and you want to work at a good pace. Begin with using your supplied chip brush by getting into all the corners and tight spots that a roller can’t get too. Apply a generous amount to your roller and begin rolling in the same fashion as the base coat Start at the inner most wall of the garage and work from one side of the room across to the opposite wall. Work across the room in approximately four foot wide passes being sure to slightly overlap the previous pass. Note: You are working from inside the garage and working your way to the garage door for a graceful exit. You should leave enough material on the surface to spread out evenly with the roller, but not so much it puddles or leaves lines, approximately 10 mils or roughly the thickness of 1 pieces of thick construction paper. Continue opening new containers of UV Top Coat and applying as necessary to completely coat and the chips. after completing the final UV Top Coat let the coating cure for 24-48 hours before foot traffic and 7 days for vehicle traffic. If you desire to apply a second top coat wait 1-2 hours after the previous coating before applying the second UV Top Coat. Application of a second coating is identical to the first so follow step 3 instructions again. If you miss a spot applying the UV Top Coat you can put on the spikes and walk out onto the floor and touch it up or wait 1-2 hours until the floor is dry to walk on and touch up the spot you missed and let that dry the appropriate amount before usage.